One thing is for sure: when in North Wales you will not only ‘keep a welcome in the hillsides’ (as the song goes) - but, as Features Editor, John Newton found out, also in every city, town and village. And even at a bustling seaside resort. Like Llandudno, called the ‘Queen of Welsh Resorts’. That's where I met genial Jon Williams standing by his beloved 1958 Leyland Tiger Cub 41-seat charabanc (early motor coach). 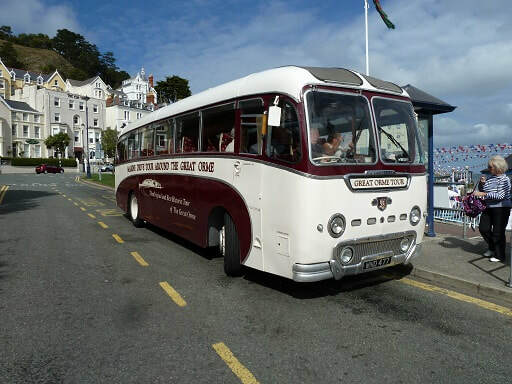 For the past 18 years, Jon has been driving his coach - three times a day, six days a week - on what he calls: 'The Great Orme Marine Drive Tour'. The Great Orme is a limestone headland above Victorian Llandudno from where you can reach the summit on Britain’s only cable-hauled street tramway. Its name derives from the Old Norse word for sea serpent. A similar limestone headland – but smaller – lies on the eastern side of Llandudno Bay. Jon is full bottle on the resort as its old charabanc struggles to climb the headland drive - and he’s quick to point out that you can see the Isle of Man on a clear day. But from a lookout, he’s also proud to tell passengers that there are no buskers, commercial businesses or food outlets along the four-kilometre stretch of beach from the Great Orme to the Little Orme. “Only Punch and Judy for the little ones,” he says. 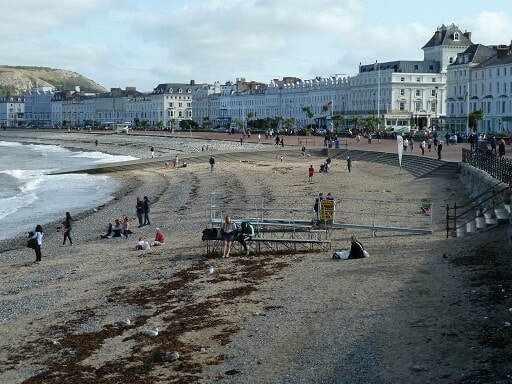 Llandudno has almost 200 hotels along its vast promenade – all in pastel colours, decreed by a wealthy pioneer. And even today, local hoteliers’ keep to his wish. A short drive from Llandudno is Conway Castle and walled town – a UNESCO World Heritage Site. The town walls are almost 1.6 kilometres (one mile) long and locals in-the know often go toilet spotting as there are 12 medieval loos jutting out from one wall. The castle has been described as a ‘great place to get lost’ along its battlements, dark passages and dungeons. 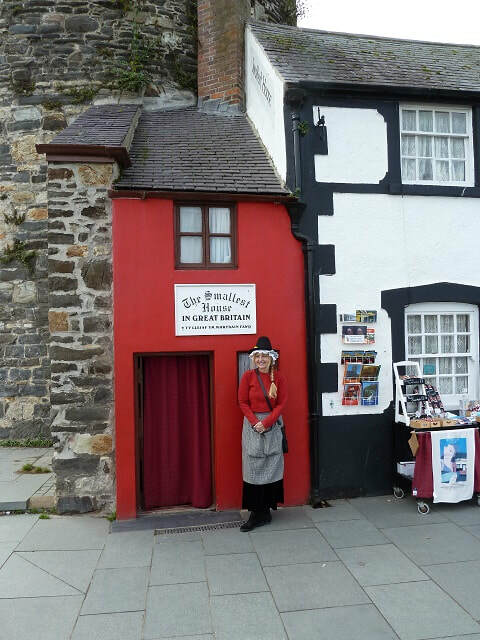 From the castle, you can walk to the waterfront to see Britain’s smallest house – just over 1.8 metres (six feet) wide and 2.4 metres (eight feet) high. Hard to imagine it was once owned by a fisherman, who was 190 centimetres (6ft-3inches) tall. He paid a weekly rent of one shilling. Driving south, there’s a turn-off to a town and its railway station that few people – (apart from the Welsh, of course) – who can pronounce the name. It’s a mouthful called: Llanfairepwllgwyngyllgogerychwyrndrobwillllantysiliogogogoch – put simply it translates to: St Mary’s Church (Llanfair) in the hollow (pwll)of the white hazel (gwyngyll)near (goger)the rapid whirlpool (y hwyrndrobwll)and the church of St Tysilio (llantysilio) by the red cave (ogo coch). The name takes up a fair length of the station platform. 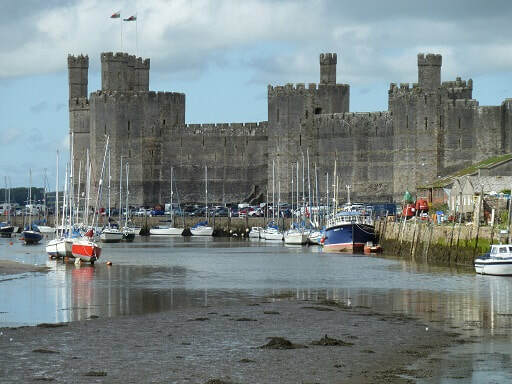 North Wales has numerous castles, but arguably the most famous is Caernarfon Castle, an almost impregnable fortress that’s claimed to be Edward 1’s most impressive stronghold. Some towers contain exhibits of his campaigns. Built between 1283 and 1301, the castle was the showpiece for the 1969 investiture of the current Prince of Wales. Caernarfon is home and northern starting point for what’s regarded as one of the world’s greatest train journeys – the Welsh Highland Railway - or Rheilffordd Eryri – which steams through the stunning Snowdonia National Park to the historic harbour town of Porthmadog. 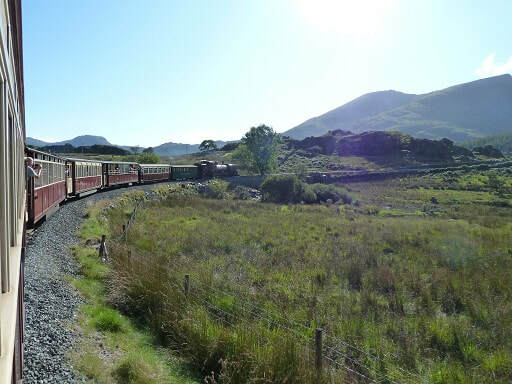 It’s Britain’s longest narrow gauge heritage railway and runs across diverse countryside for just over 40 kilometres (25miles) past the foot of Snowdon – Wales and England’s highest mountain at 1085 metres. 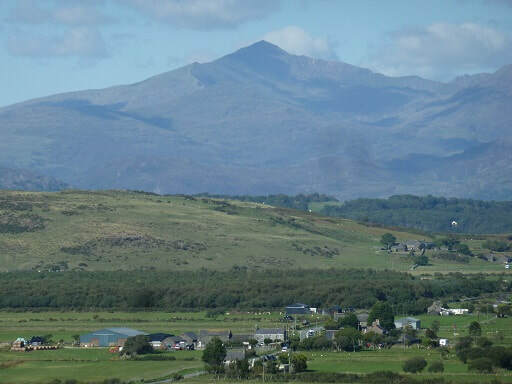 You can get off along the way at Rhyd Ddu, from where hikers will find one of the best paths up Snowdon starts. or picturesque at Beddgelert. Passengers can either travel first class in classic Pullman carriages with freshly-cooked meals delivered to your seat, or in third class, where there are large windows, comfortable seats and an ‘at your seat’ buffet service. 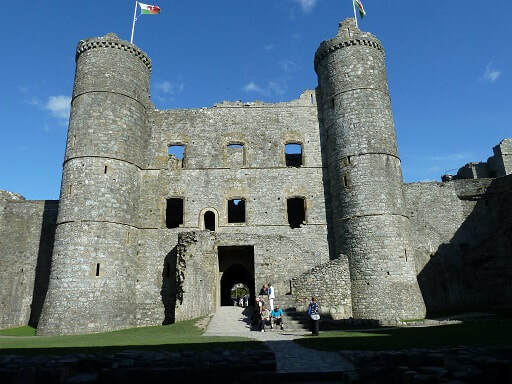 My three-day drive through some of the beauty spots of North Wales ended at another castle town – this time Harlech. Set on cliffs overlooking the sea, Harlech Castle was the last castle built by Edward 1 – and the most impregnable. Its resilience was tested during the Wars of the Roses when it survived a seven-year siege – the longest recorded in British history. The castle, which overlooks the world-class Royal St Davids golf links, is another of Wales’ World Heritage Sites. From the countryside to the seaside, there are many gorgeous beach walks along the North Wales coastline away from the maddening crowds. But, if you want a little action at upmarket resorts, then places like Abersoch, Criccieth and Nefyn are ideal stopover destinations for perfect days. With its medieval castles, steam and mountain railways, pristine beaches, scenic drives with glorious sea views, historic towns and villages, picture postcard countryside and world-class restaurants and hotels, North Wales is as good as it gets in Britain. And there’ll always be a welcome – and some wonderful voices, too, in a land of singers and storytellers. *Places to stay (all are part of the Welsh Rarebits accommodation collection). This award-winning 17th century country house hotel stands in over 80 hectares (200 acres) of its own parkland, with views – on a clear day – of Conwy Castle and as far as Snowdonia. The 15-room hotel also offers 16 cottages located in the grounds, providing self-contained accommodation for guests seeking privacy. It also features a rejuvenating spa and leisure complex with a 15-metre (50ft) swimming pool, whirlpool, sauna, steam room, gym, and beauty treatment rooms. Two-course dinner menu is 35 pounds or three-courses for 40 pounds. You can’t go past the Welsh lamb. Superb. From this Georgian manor house, built in 1780, you can walk – and taste – the spectacular Llyn Peninsula Coast Path – an area of outstanding natural beauty. The 10 bedrooms are a mix of country chic doubles and suites, all with views over the gardens. Tucked away in just over two hectares (five acres) of pristine grounds, the property has a highly-rated restaurant specialising in produce sourced from local farmers and fishermen. In English, there are two alternatives for the meaning of the name Plas Bodegroes. Plas means simply hall or place, and Bod is literally he infinitive ‘to be’ or ‘in existence’. Egroes is old Welsh for the hips of the wild rose – and the even older name for a knot or plait in an ear of corn! So Plas Bodegroes translates roughly as Rosehip Hall. Just a stone’s throw away from Harlech Castle, host and Chef Glyn Roberts and wife, Jacqueline, run a seven-room historic property full of character. But it’s the award restaurant and Glyn’s top-drawer food that will blow your mind. It did mine! 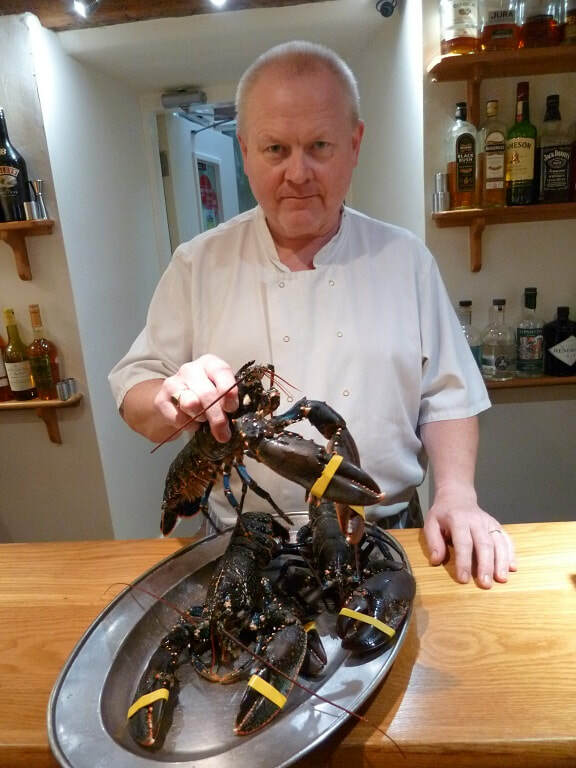 Starting with freshly-caught Aberdaron crab, pea shoots, avocado and melba toast, the main course was a sight to behold – blue lobster – or known as European lobster - caught that morning in Cardigan Bay. It’s grilled in the shell with a mustard white wine and cheese sauce, new potatoes and fine beans. Other delicacies from Glyn’s kitchen are local line-caught wild sea bass and roasted porchetta (boned and rolled suckling pig).